Bonner Paddock is not messing around. He was the first man with cerebral palsy both to climb Mount Kilimanjaro unassisted and to complete an Ironman triathlon. He is the star of the 2009 documentary Beyond Limits about his journey to the summit of Kilimanjaro, and now, with this memoir, he writes more deeply about the mental side of this feat as well as his journey to becoming an Ironman. One of Paddock’s most formative experiences was meeting Jake Ryan Lee Robert, a 4-year-old boy who was suffering from cerebral palsy, too. Jake tragically died soon thereafter, and Paddock knew that he would never be the same. It was out of this experience that Team Jake was born, and Paddock has gone to unbelievable lengths to honor Jake’s memory since that day. Paddock’s outlook sure inspired us, and we think this book will change the way you see the world, too. 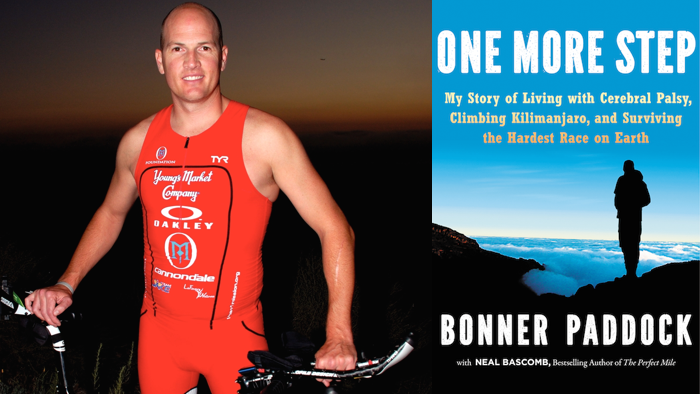 Here, Paddock talks with Bookish about his incredible journey and his illuminating memoir, One More Step. Bookish: A major theme in your book is embracing your weaknesses in order to understand your strengths. How did you arrive at this revelation, and how has it shaped your life since then? Bonner Paddock: Once you admit what your weaknesses are, they become your strengths because you can be honest about them. For 30 years, I fought them, but they actually become bigger weaknesses when you fight them like that. After Kilimanjaro, I had to take a hard look at myself and address them. I needed to look within myself to explain a lot of the dark things that I had inside me that I wasn’t willing to look at until then. Bookish: You are the first person with cerebral palsy to climb Kilimanjaro, and as if that wasn’t enough, you were also the first to complete an Ironman. Did you ever think that you might be attempting the impossible? What kept you going? BP: When I first did them, there wasn’t a link between them or a plan to do both. I guess it felt a little more realistic because I did one and then tried the other after that. It was never that huge—I never said, “Let’s just do both of these in five years.” With the biggest, most insane things, if you break them down into smaller segments, it becomes much more doable in your mind, and once your mind is wrapped around it, then you can make it a reality. Growing up, I never did it that way. I always wanted to compare myself to others and be the best. But now I do what’s best for me, not what everyone else is doing. This mindset set me on that road of attempting what people think is pretty crazy. Bookish: Over the course of your book, you meet a whole host of amazing people. Who is the most inspiring person you met along your journey, and do they still impact your life today? BP: The most impactful person by far is Jake’s dad. I don’t know if there’s anything worse in the world than a child dying. Anybody who learns to cope with the sudden death of their very young child and finds the silver lining is amazing. I don’t have kids so I can only imagine, but I think it would be absolutely devastating. To rise above that and have such a cool outlook on life is amazing. Every time I see him, it’s always refreshing and he inspires me to keep pushing myself forward. Bookish: A truism about endurance sports is that they force you to realize that what you once perceived as your own limits actually aren’t limits. Did your ideas of your own limits change as you worked to summit Kilimanjaro and complete an Ironman? How so? BP: My limits have definitely really evolved and changed, and my confidence has risen. The most important thing was letting go of all of the anger with my family and not taking anything personally anymore. Those emotional challenges are the biggest challenges, not the physical ones. This book is what led me to believe and understand the importance of not backing down. I also learned that healing from physical pain is easier than healing from mental pain. The barriers that were holding me back were because of my brain, not because of my cerebral palsy. Bookish: You were coached by Greg Welch, who is widely considered to be one of the best triathletes ever. What was the most important lesson you learned from him? BP: He has such a different outlook on life—he has found so much joy in his path. If I missed a day of training, he’d say “We live to fight another day!” or “Don’t worry about it, mate!”. We just had so much fun. He helped me enjoy the training as much as possible even when it was hard. I loved the journey because I was open to it, and to meeting people. I loved the Ironman so much more than Kilimanjaro, and I owe that to Welch. His love of the sport, and of people, was infectious. “You’ve got to enjoy the journey, mate” he’d say. Or, “You’re not here to win the race,” “Race your own race,” “Enjoy it and support each other.” The Ironman is cool like that—everyone is out there to support each other. Bookish: What do you hope your reader takes away from this book? BP: I hope that they take away that, for the challenges we all have in our lives, it’s better to talk about them and to be open about them. When you shy away from them, it causes more problems. My family did that. Books like this hopefully show that, in the face of big challenges, loving one another and embracing the challenge and talking about it is the healthiest way to get through it. Bookish: What can readers who are inspired by your story do to get involved? BP: We’re coming out with a global Team Jake challenge. You can register on my web site to run a half marathon and a full marathon, and wear a Team Jake shirt when you race, and Oakley will give you free eyewear in hopes that it will set you off on that path. You don’t have to raise any money, we just give you the eyewear. BP: I’m definitely done with endurance sports… except I’m going to take the Team Jake challenge. I’m not medically cleared yet, but if that doesn’t happen, I’ll walk it. After climbing Kilimanjaro, I still had this burning inside me to do something else. But after the Ironman, I was ready to tackle the book. The book allowed me to make peace with a lot of things. I don’t have an insatiable desire to compete in endurance sports anymore, even though I loved the challenge. Instead, I’m focused on how I can help the OM Foundation.